You'll be greeted by friendly faces like Scott and Heather! We have two worship services to choose from, one at 9:00 a.m. and the second at 11:00 a.m. Parking is ample, but you will want to arrive early. Visitors, we've got special spaces reserved for you, simply follow the signs when you pull in! 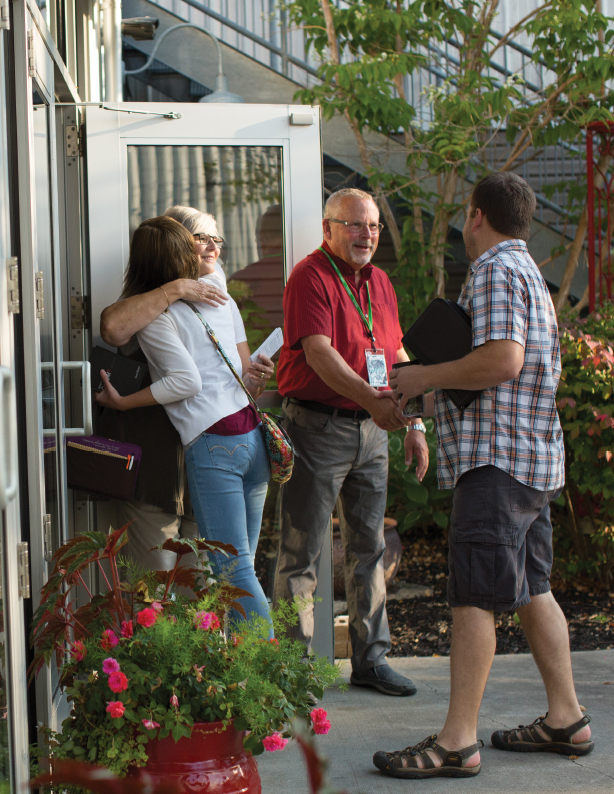 Upon entering our doors, you will be greeted with a kind “hello” from folks with helpful answers. Dress is casual, the worship is contemporary and the atmosphere is friendly and laid back, even though so many of us have had our lives changed in amazing ways because of what God has done. You can get a cup of specialty gourmet coffee at our coffee shop, and get some more information from the Welcome Center in the front lobby. Have a look through our church building before you arrive. This overview will help you find where to take kids, where to get a great cup of coffee and where to use the restroom. Have a listen to Pastor Steve and our other staff preach the word of God. 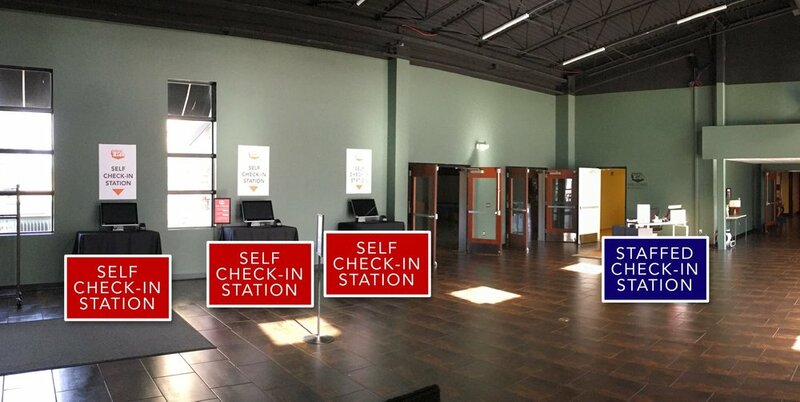 This location in the South Hall contains a staffed check-in station to help your kids get where they need to go. You will be able to check your children in at one of several locations near each main entrance in the church. Check-In begins 20 minutes prior to each service. You will receive a tag with a number that will flash on a digital screen during the service if your child needs you. When the service is over, simply bring your child’s tag back to his or her class for pick up. We know babies. Sometimes they just aren't ready for the nursery :). We have a video feed of the service in our North Hall where you can sit with a child. A private cry and nursing room is also available in the nursery if the need arises. 2 years to Kindergarten: Upstairs Classrooms (use the staircases on both ends of our main lobby, or the elevator at the south end of the main lobby). 1st and 2nd Grade: The Activity Center (aka The A.C.) at the south end of the building. If you have any trouble finding these rooms, our friendly greeters (located at each entrance) are more than happy to help you and lead the way! Each Sunday, our hospitality team hosts a visitor’s reception immediately following the morning service in the North Hall (again, see the map!). You will be able to tell us about yourselves, get answers to any questions you may have about the church, about faith or about our incredible and loving Savior, Jesus Christ and you will receive a free gift from Wellspring. Wellspring Church is located at 4466 Bauer Road in Hudsonville, just east of 48th Avenue on the south side of the street. From ALLENDALE: Take Lake Michigan Drive to 48th Avenue and turn south. Turn left onto Bauer Road at the Georgetown Ice Center and Wellspring will be on the right. From GRAND RAPIDS: Take I-196 west to Exit 69C (Baldwin Street) and turn right on Cottonwood. Follow Cottonwood to Bauer and turn left. Wellspring will be 4.2 miles down Bauer on the left. From HOLLAND: Take Chicago Dr/I-196BUS/M-121 East to 48th Avenue. Take 48th Avenue north to Bauer and turn right. Wellspring will be on the right.